I have a POWER-PACKED POST for you today! I have been reading away here, remember I told you I ordered several books? 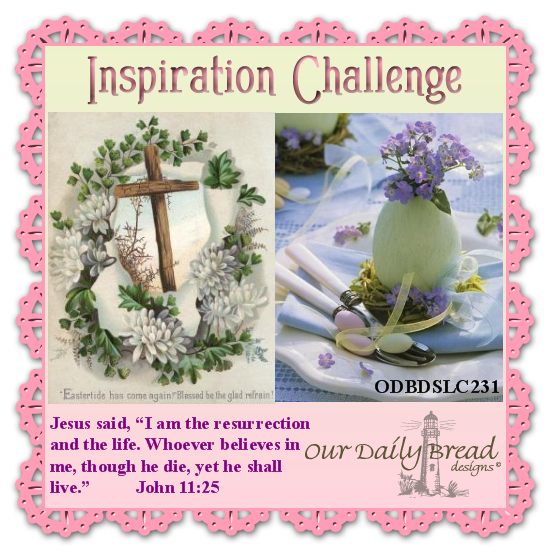 I have been devouring them & finally pulled myself away on Monday to make my Easter Cards. I am learning so very much, of which I am so grateful. I thought I would have to find another challenge to enter my cards in. Due April 5th, by 8 p.m.
(I don't know if they'll accept my cards, but we'll just hope! I did several Easter Cards! I rarely do each card differently, but I challenged myself to do that this time. 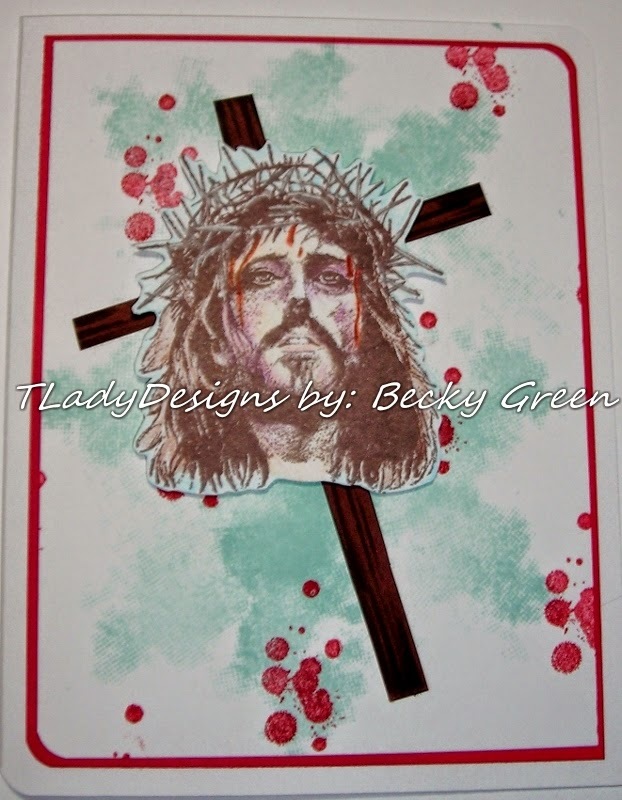 I used ODB- Crown of Thorns & ODB Christian Faith Collection Paper. The inside using the same set. I decided to go CAS on this one, focusing on Christ's blood. 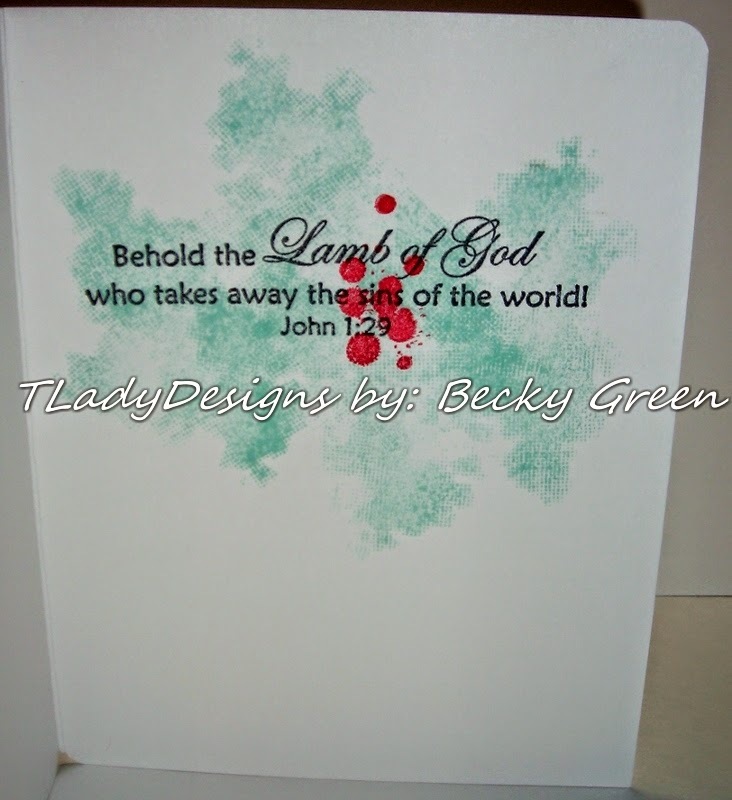 Here I used ODB- Lord is My Shepherd for the sentiment. Notice: The blood stains/ red dots, cover the word "sins." 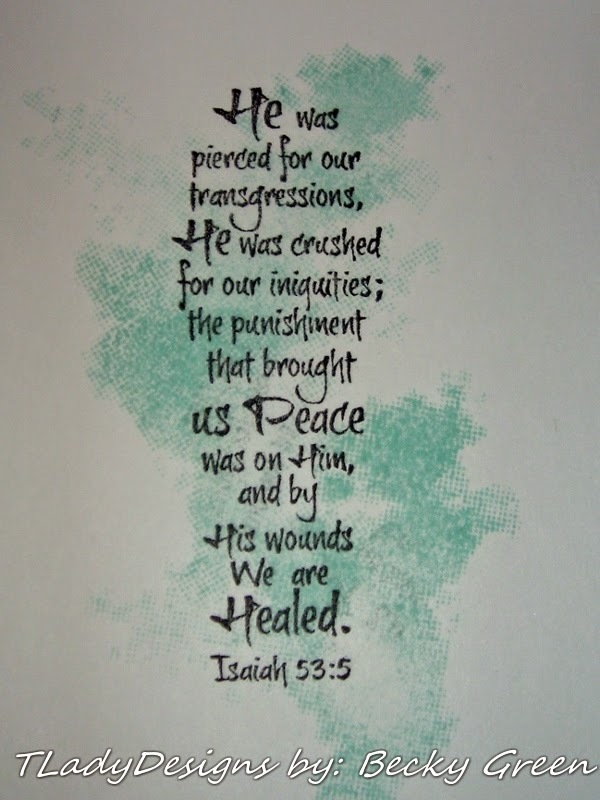 Just as His blood covers our sins when we ask for forgiveness. 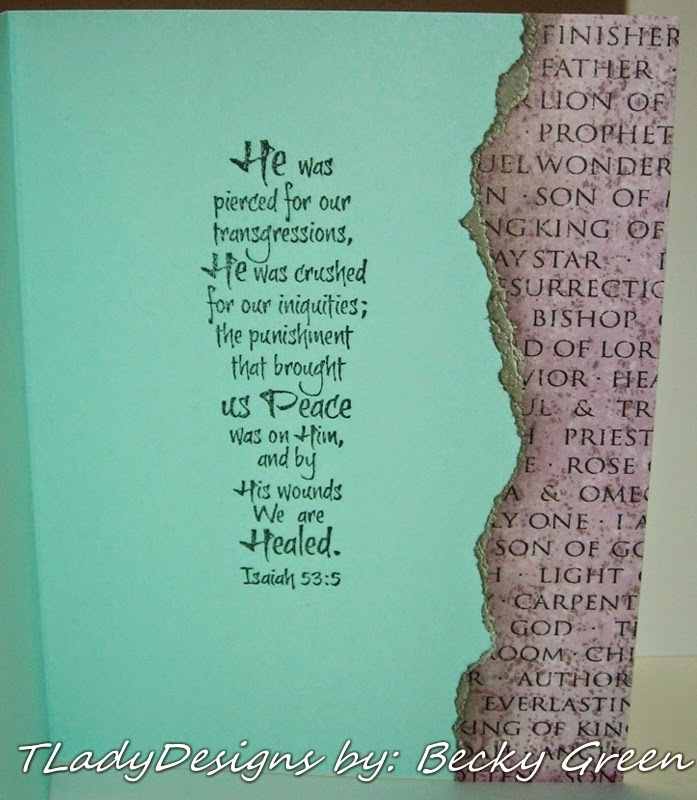 The inside using ODB- Crown of Thorns. Lastly, I went CAS again. 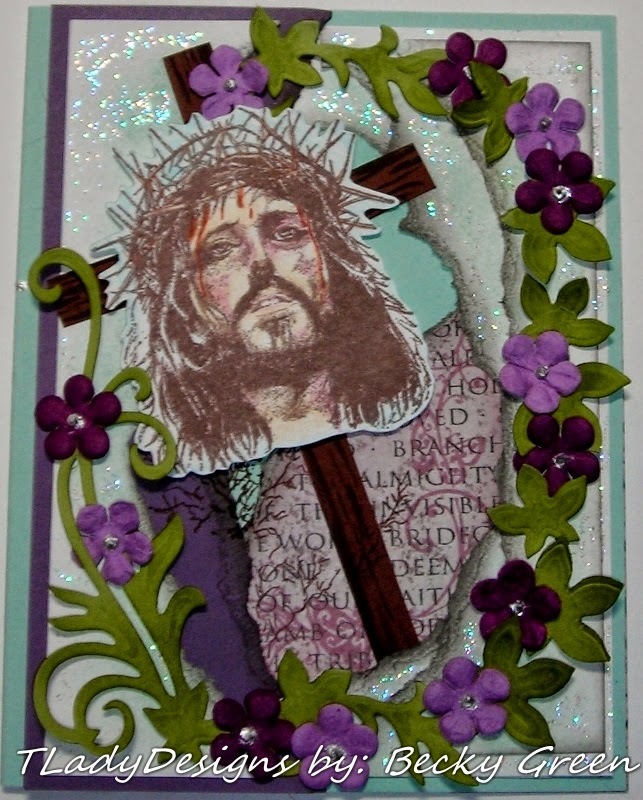 The inside is the same as above, using ODB- Crown of Thorns. 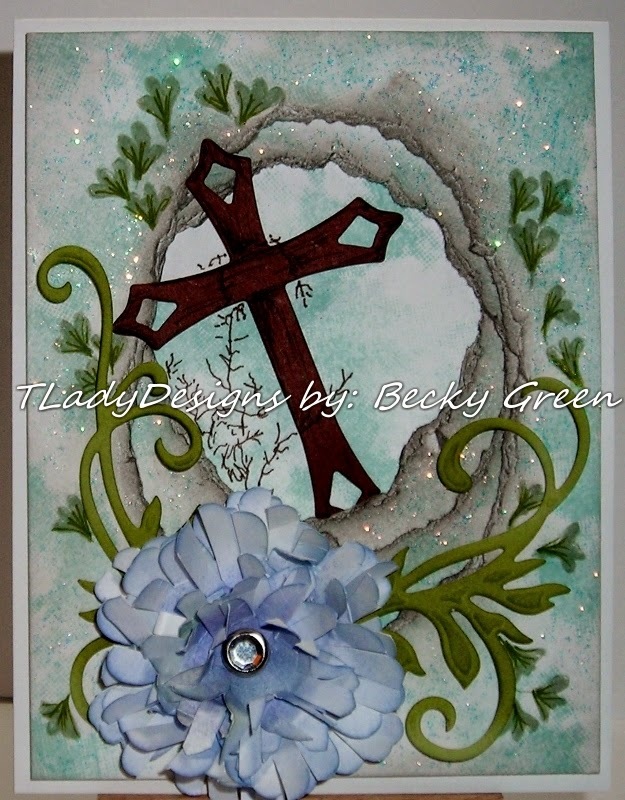 I will also be entering some of these cards in the SSS Monday-Pastel Challenge. Due by April 5th, at 11:59 p.m. Eastern time. even though it is about another subject. She directed her readers to several books. Those are just some of the books I ordered. I/We have been through "Spiritual Abuse" also about 10 years ago. & I am learning much about the dynamics of what happened. I recently heard a Pastor speak about the end times, & he said he had found something in Scripture that he believed was a "secret, hidden in Scriptures;" that people that don't go to church & pay tithe, won't make it in the rapture. My attention was immediately grabbed with that statement, because it is so opposite of what I'd learned & what I've been taught my whole life! This man is quite esteemed in his denomination & esteemed in other denominations also for his insight into the Scriptures. My friend is the one who directed me to this man & his statement. were their family & were the leaders of the church; they were the Pastor's. They were the very same people that had abused us, when we were there. The boys didn't expect to go up with the Lord in the rapture, they had given-up. Then hearing this statement from a Pastor who was esteemed, confirmed what they had felt. I told my friend, that isn't what Scripture says! I don't care if he thinks he has found a "secret, hidden away" in the Bible! He doesn't have one up on the average man, because he is a "minister," we are ALL EQUAL in God's eyes--one man doesn't receive messages from God that ONLY HE can understand or in this case, be the only one who has found this "secret, hidden away." God loves us & he WOULDN'T make things this important secret like that. He will/did make things EASY FOR US TO UNDERSTAND so we CAN make it in the rapture! The part that stood out to me in my reading? The sentence that said right out, "Whenever religious leaders claim special knowledge of God or the Bible which is hidden from the rest of us, we may be in the presence of false & abusive teaching, or something worse." I will say, there are a few things in this book that I disagree with, not as a person who is a psychologist or a person of higher knowledge than this man, but from out of experience. I will also say, that there isn't much I disagree with. As with anything, read from an understanding that not everything written is absolute truth, & every one's understanding is influenced by experience. More that stood out to me? The Pharisees in the Bible are in our churches today---- The Pharisees were those who loved God, studied the Scriptures, & had seized power in the Temple-not elected, & they dictated to everyone else as to what was acceptable before God or should I say, what they thought God wanted. They were vocal & wanted every eye to see them as "Spiritual." or whether they just fell into that mindset over time. We, as laity are usually busy running around DOING whatever it is that we feel needs to be done, as a "ministry" for the Kingdom, to further the Gospel--- works in the church, tithing, etc.! We end up worn out & tired. Those ministers that teach you receive Salvation through works etc., are "self deceived." See, those works YOU DO, benefit the one in charge.....it makes them look good to the board, to the district officials...., etc.! Those ministers KNOW the truth, but choose to walk away from it, choose to promote Salvation through works, manipulating people....etc.! They are "self-deceived" thinking they will profit! At the same time these ministers are self-deceived, they are withholding the Kingdom of God from you. They have trivialized the Blood of Christ! When all Christ wants you to do is fall in His arms! "My grace is sufficient for you,"
We don't need to add anything else to His grace to be accepted by Him! Think about that, it is SO FREEING!!! This song tells it all. I believe THIS is the reason people are leaving the churches in droves today! How can God judge the ungodly, before He judges His church/people? What I have written about here, is only one aspect of Spiritual Abuse. As with any abuse, there are all different kinds. * Healing Spiritual Abuse, by Ken Blue. * Set Free, by Jan Coates. Power & Control, Narcissistic Behavior, etc. The dynamics are the same. This is a topic that goes beyond this little post. I am just giving the information to help many understand the power of Spiritual Abuse & that there is HOPE!